You are here: Home / Reviews / Dog Stuff / Does Your Dog Have Itchy Skin? I have gotten several questions over the years from readers regarding their dog’s itchy skin. Mostly this conversation has been in regard to allergies and the type of food that their dog is eating. For the most part, I believe that itchy skin should be addressed “internally” by adjusting your pet’s diet. However, there are some obviously external causes for itchiness like fleas, frequent baths and skin fungus. Even if the cause IS internal, sometimes your dog just needs a bit of relief (and you too sometimes because a constantly itching dog can be annoying). Chester used to have itchy skin when he was a puppy. It was pretty predictable – it would happen for two or three days after a bath. Once in while he would develop a raw spot. When he got really itchy like that I would often use topical hydrocortisone on the problem spot. I usually used the human version because that is what I had on hand but you can buy stuff made especially for pets. I used the dobber (like a bingo dobber) version so that more would go on the skin and less would end up on the hair. Anyway, that has been by go-to treatment. This morning I was surfing the internet looking for pet products made in Seattle. I found a company called DERMagic that makes products to stop itching and heal your pet’s skin. To be totally clear, I have not tried these products myself. I had never even heard of them until this morning. The products look pretty promising though. All of their products are made in the USA from natural products produced in the USA. Their products go beyond just stopping the itching to actually eliminating skin disease and healing the skin. The “system” they developed is actually 4-steps but it looks like you can use the products independently for more minor itching cases. Their website says their most popular product is the Skin Rescue Lotion that “offers pets fast and effective relief from skin irritations, hot spots, black skin disease, scaly skin, flea allergies, dermatitis, and dry skin conditions”. 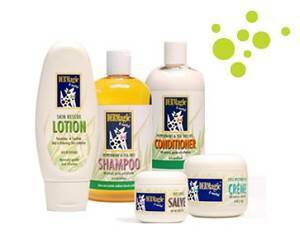 In addition to single, full-size products they offer a starter kit and a Groom and Go travel kit. They also offer a couple of their products for cats. I’m going to try it. My Zoe has it bad. My other two long hairs itch too. Very good info. I am allergic to fleas, so that’s really the only time my skin itches, butts we Terriers are prone to allergies, so it can pop up at anytime, so any info is helpful! It’s always good to have the anti-itch stuffs ready to go, just in case..
We had a cat that was deathly allergic to fleas when I was a kid so we feel sorry for you. It’s always nice to know what kind of products are out there to help with itchies. Sometimes you have to try a few things before you find what works for you. We’re always looking for help with Stetson’s skin allergies. He’s doing well right now, but when allergy season comes around he gets pretty itchy. So far only Atopica and Prednisone has worked for Stetson and neither is a good long term solution. I am sure this is not a good long-term solution either but it doesn’t hurt to try different things. Their description of the product sounds more “medical” that a lot of others I have seen but we both know that product descriptions can be deceiving sometimes. We still might give it a look. Thanks! The first year we had her, Shiva’s skin was pretty flaky. Our vet at the time didn’t seem to think it was a big deal, just recommended we supplement with fish oil. So we did for awhile and the flakiness actually went away but it became expensive so we stopped. Despite that, her flakiness has never returned. I don’t know if the food she is eating now is just better or what but it works for me! Chester’s itchy skin has lessened as he has matured. I bet the fish oil helped a lot but maybe she has grown out of it now. Interesting product. You’ll have to let us know if you try this out. The hot spot cream would be nice to have on hand! I gravitate toward natural home remedies only. Commercial products are often made with all kinds of toxic things. They are less expensive and often multi- purpose, too. Coconut oil and olive oil is good for them, internally and externally and is totally safe. Apple cider vinegar is also great for adding shine to the coat, deodorizes, treating dandruff and repelling fleas and ticks. A bit of lavender oil does the same, as well as calms down dogs with anxiety. I recommend natural alternatives to fellow per owners often. I have heard good things about coconut oil. Why use something expensive when something like that works but if you look at the ingredients on this stuff it is all natural and pronounceable (and familiar). Sometimes itchies are cause internally due to an allergy and sometimes it is caused my environmental thing. Grain is one of the most common “internal” allergies. I am glad switching his food helped. Even if the cause if itchiness is internal, sometimes external creams can help with temporary relief…as you have found. Very interesting! I’d love to try this stuff. Buster has itchy skin which seems to be environmental because it gets better or worse depending on where we are in the country. It’s really bad up in your neck of the woods! His skin is also on the dry side, so I try not to bath him too much and feed him a can of sardines on top of his food every night. That seems to help, too. 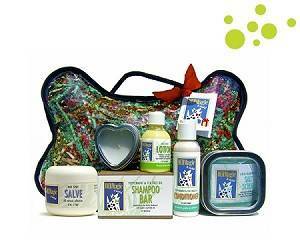 Mom worked for Bobbi Panter Pet Products her Itchy Dog shampoo is the best you can buy all natural and gentle. I haven’t had dry skin since! DERMagic products really do work especially the Skin Rescue Bar along with the Skin Rescue Lotion and Salve. I’ve used them on myself along with the Cell Restoration Creme when I had a large section of forearm skin missing from road rash (pulled down the street by 3 Labs). My Chester, a very light yellow Lab has a yeast problem, staph infections and the soap plus lotion clears these right up. Recently used the salve on my cats ears, which were swollen and very itchy. They cleared up in two days. I feed mostly grain free, raw foods. Thanks for the product review! My retriever used to scratch like crazy until I started adding some peppermint oil in her bath. All the same, I think I’m going to try this one out; I’ve been looking for a long-term solution to her problem, so thanks for this!